Thank you so much to everyone who came out to the Go for the Goal’d program this week. 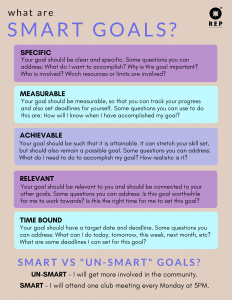 During the program we talked about SMART goals and how setting them can help you manage your time and motivate you to handle your responsibilities! 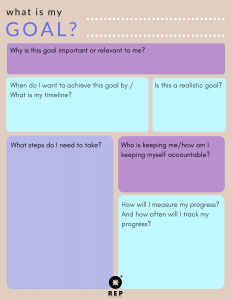 Here are some resources to help you set and reach your goals 🙂. For info on upcoming REP events, check out our calendar. Happy goal-setting and mug-making!